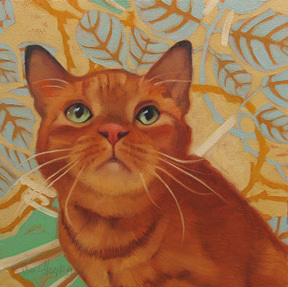 Diane Hoeptner: Darby, a painting of a cat that will be given away, free! Darby, a painting of a cat that will be given away, free! "Darby" Oil on wood, 8" x 8"
It's my annual give away! Wow, this blog is almost seven years old... Time sure does fly! I've been a subscriber for quite a while already...would LOVE to win a painting!! Great idea! I'll keep my fingers crossed! Your generosity is as special as your paintings. And they are extra special. Yay!!! I'm so excited!!! I hope I win one this year!!!!!! Love, Love, love your paintings!!! Thank you!!! Beautiful color on this cat! A chance for a cool painting! Congrats on producing and posting some of the best cat art ever! I hope I win! I love your work. Thank you for the opportunity to win one of your pieces! I found your work on Pinterest and love how you combine patterns and pussycats and sometimes even flowers. I love this one especially. I would be great to hear more about your painting process. Do you cradle your wood panels? Do you like to use birch plywood or masonite? How long, in general, do you sped on a painting? Where do you look for you pattern inspiration? Thank you for sharing your lovely art work. I will keep my fingers crossed for one of your lovely paintings. Congrats to your anniversary! Great cats portraits!